Access Tower Hire. Fast Free Quotation From The UK Team. 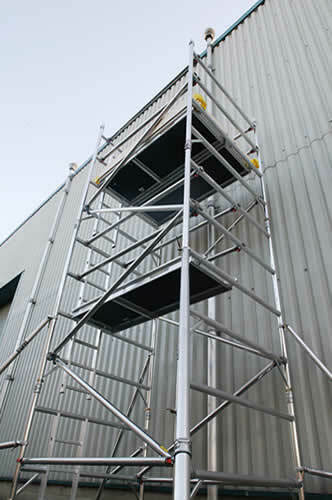 Highest quality access tower hire from just £41.60+VAT per week. 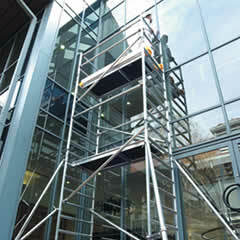 Looking for an Mobile Scaffold to hire? Why not call us now on 0844 704 3445. Our PASMA trained staff can advise you on the very best equipment for your project. Many are concerned that the equipment they with get on site will be poor quality, late or just not the tower for their job. We go to great lengths to make sure you get the equipment when promised, The mobile Scaffold is British standard kit and delivered to you serviced, inspected and ready to use. Our delivery dates come with a money back guarantee. Please call now for UK delivery of Working at height. Huge trade discount rates on all orders. Fully PASMA trained staff get you the right one for your project. Guaranteed delivery date. Your money back if we fail. We have all kinds available. Many Customers a variety of different issues on site. Perhaps they have an obstacle such as a desk to work over. Some electrical work to do or just stairwell to work on. We have many in stock to suit these projects. Just call on 08447043445 and a member of staff will help you find the right scaffold for your job. Call Lakeside-hire for a 2 minute quote, great advice and the safest equipment. Home Self build/ domestic platforms. Using a hire service rather than retail purchase is standard practice on many construction sites for several reasons. Primarily, in order to retain a profitability to the work, site workers recognise that they need to keep their costs down, and using several thousand pounds worth of equipment on a hire rate reduces the outgoing cost. Also, site space is often taken into consideration. Many sites would find it difficult, or even impossible, to have access equipment taking up site space when not in use or finished with. Via a flexible delivery and collection service that comes with a hire, you don't have to worry about the equipment cluttering your site once you've finished with it. Recommended time and time again by our clients. A company with a high level of repeat business and regular positive customer feedback. Call now for a low cost quote within 2 minutes for your alloy scaff, fast no hassle booking service and if we fail to deliver you get the Equipment free of charge. Other equipment can also be requested along with the delivery. Scafftags, Acrows, Ladders and powered scissor lifts. If you haven’t used an one before this is how easy it is. 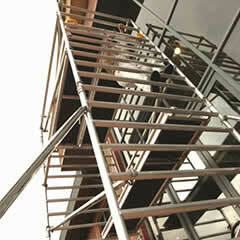 Have you got any questions about Hiring Scaffold Tower?